Welcome to Tuesday Tips, the weekly guide to practicing positivity. Sometimes all this positive "thinking" can get a little overwhelming, so this week I'm cutting the tips down to the bare minimum. What are the very basics of feeling good and creating consciously? If I had to bring four Tips to a deserted island with me, these are what I would pick. A smile is one a the few actions you can take that will instantly make you feel better. A smile is the easiest way to make a friend, or to smooth over a rough situation. A smile is the most appealing thing to see in another person. When you smile, the world smiles back at you. Whenever I get stuck in an infinite loop of negative thoughts, all I have to do is start counting in my head. When you place your attention on the numbers, instead of your thoughts, you release resistance. Thoughts are the only thing that make us feel bad—when we take a break from thinking, we can return to our natural state of feeling good. You don't even need to think to make decisions—your intuition will always let you know. 3. Say "I love you." EVERYTHING we want, we want because we want to feel loved! Money, fame, health, relationships—whatever we desire, it's because we're looking for love. Love is the feeling of being connected to others, to life, to everything. When we give the love we want to receive, it is reflected back to us. Begin with saying "I love you" to yourself, and then to the people, places and things in your life. It takes balls to open up and project love, but you have to be the one to do it first. If you're looking in a mirror, the only way to change the reflection is to change yourself. 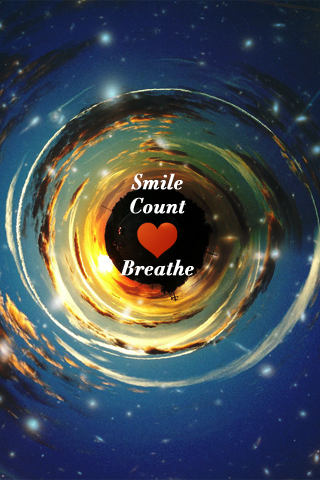 Focusing on your breath, like counting, is a fast way to take your attention away from negative thoughts and into the present moment. Deep breathing calms your heart, brings nutrients to your body, and brings peace to chaos. You can always find alignment through your breath. For more on aligning with breath, check out this Spirit Science video on the heart. This week your homework is to share the one thing that always puts you back in alignment. If you could bring only one (or four!) positivity tools to the deserted island with you, what would they be? Post your answers on this thread in the SoLD Facebook group. Thanks for playing, I love you! Thank you for your insightful list! Along with what you chose, I would bring happy memories, whether they be of others and myself or moments when I felt the most confident and loved. Excellent idea Dana! I like to think of happy memories as “vibrational bookmarks” that help me practice those feelings you mentioned – confidence and love. Thanks for your input! A surprisingly good post. I actually needed this when I found it, and it worked for me. I’ll keep this lesson in mind in the future.